“La Bievre” runs under the fifth and thirteenth arrondissements of Paris, and was covered in 1912 after centuries of service to dyers, tanners and other crafts people. The river itself originates 33 kilometres from Paris in the Yvelines (near Versailles) and feeds into the Seine at Gare d’Austerlitz. The Bièvre was once a vibrant river that attracted people as far back in the Neolithic period, eventually named after the beavers that lived on its banks (derived from the Gaul, bèbros). La Bièvre, 1865, one of the earliest surviving photographs. Photo: Charles Marville via the Metropolitan Museum of Art. (Some of Marville’s photographs are also held by the Musée Carnavalet, Paris. 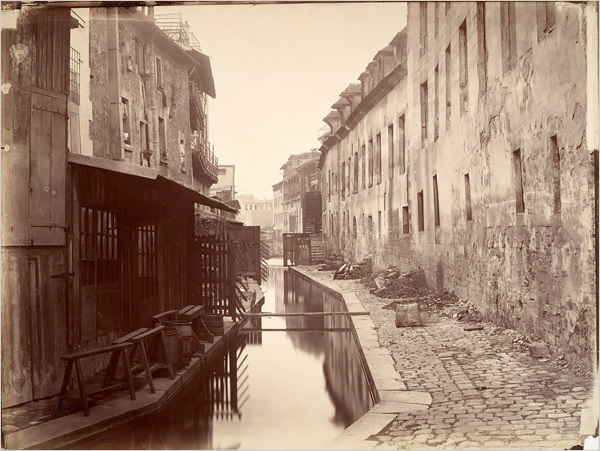 Widely acknowledged as one of the most talented photographers of the 19th century, French photographer Charles Marville (1813–1879) was commissioned by the city of Paris to document both the picturesque, medieval streets of old Paris and the broad boulevards and grand public structures that Baron Georges-Eugène Haussmann built in their place for Emperor Napoleon III.